Cut the squash vertically down the center and use a spoon to scrape out the seeds. Cut the squash into 2-inch pieces or half-moons. Put on a large baking sheet and toss to combine with the Brussels sprouts, pumpkin seeds, olive oil, turnips, carrots and some salt and pepper. Roast the vegetables, stirring once, until caramelized and tender, about 30 minutes. Test for doneness with the tip of a sharp knife; it should go through the vegetables easily. Transfer to a large serving platter, drizzle with the Balsamic Vinaigrette and garnish with the parsley, currants and goat cheese. In a medium bowl, whisk together the oil, vinegar, mustard, garlic and salt and pepper to taste until completely combined. 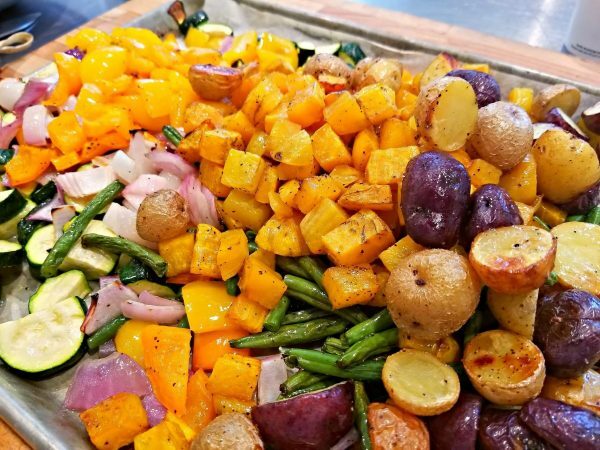 -Post it to Instagram as “Mezzaluna’s Roasted Vegetable Salad” and tag @chefjohnpaulk. We LOVE to see your pictures and GOOD LUCK with your salad! The 4th of July is in just a few days and I thought it would be timely to put out a recipe for my MIDORI Shooter! I love the bright green hue of Midori. It’s made from Muskmelon in Suntori, Japan. It has the taste similar to honeydew melon and is a very refreshing cocktail for the summertime. 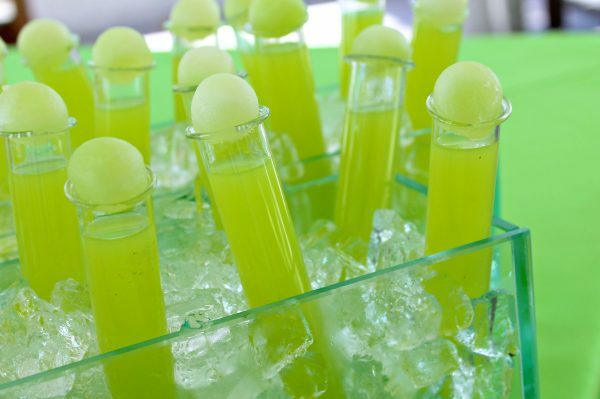 Here is a great recipe for what some also call a “Honeydew Melon Ball Shooter”. Enjoy! Pour equal parts Midori and pineapple juice into a cocktail shaker. Shake and strain into a chilled martini/cocktail glass. Add a small amount of amaretto by pouring close to the inner edge of the glass; allow to “sink” to the bottom. Float Jagermeister on top; if needed, hold spoon to edge of glass while pouring into the spoon. Top with a melon ball. -Post it to Instagram as “Chef John’s MIDORI Shooter” and tag @chefjohnpaulk. We LOVE to see your pictures and GOOD LUCK with your cocktail! NEW RECIPE: Chef John’s Famous Beef Tenderloin! SLURGE on your partner or group of friends. This dish is so succulent, tender and juicy. 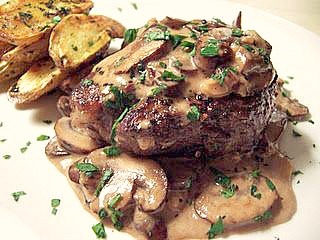 The brandy cream is magnificent along with the fillet and hearty mushrooms. Pair with a light green salad and some crusty bread to soak up the sauce. Chop off top of garlic clove, place on piece of aluminum foil. Drizzle with olive oil and salt, wrap into a package and roast in a 450 degree oven for 45-60 minutes, or until garlic is soft enough to squeeze like butter. Meanwhile, cut potatoes in half, drizzle with olive oil and truffle oil then add salt and pepper and parsley. Lay cut side down on a baking sheet (lined with foil) and cook for 30-40 minutes at 450, or until golden brown and crisp. Add mushrooms to the same pan the steak was seared in and then squeeze roasted garlic into the pan. Sauté and then add brandy, allowing to boil rapidly and flame. Reduce until almost all liquid is gone. Add half and half, simmer to reduce and thicken slightly. To plate, top a mound of mushrooms under the steak, then pour remaining sauce and mushrooms over. Stack potatoes on the side of the plate to balance the dish. Garnish with parsley. Enjoy! -Post it to Instagram as “Chef John’s Beef Tenderloin” and tag @chefjohnpaulk. We LOVE to see your pictures and GOOD LUCK with your dish! I adore flank steak. It is versatile and relatively inexpensive. Flank steak is widely available and easy to recognize by its long, flat shape and distinctive longitudinal grain. Cutting across the grain breaks up the muscle fibers for more tender slices. This salad is incredible bursting with flavors and texture. 2. To prepare steak, heat a large nonstick skillet or grill pan; coat with 2 tbspn. olive oil over medium-high heat. Rub both sides of steak with generous amount of salt and pepper. Add steak to pan; cook 6 minutes on each side or until desired degree of doneness. 3. Remove steak from pan; place on a cutting board. Cover loosely with foil; let stand 10 minutes. Cut steak diagonally across the grain into thin slices. Place steak in a bowl. Drizzle with half of the dressing; toss well. 4. To prepare salad, combine watercress and next 8 ingredients in a large bowl or on a platter. Drizzle mixture with remaining dressing and toss well. 5. 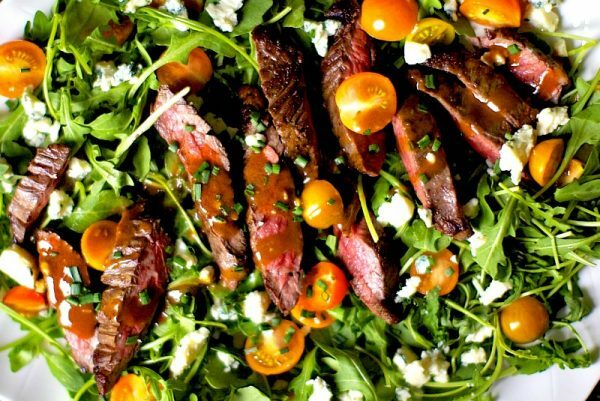 Divide the salad among 6 plates; arrange steak evenly over salads. Sprinkle each salad with chopped peanuts. -Post it to Instagram as “Chef John’s Thai Steak Salad” and tag @chefjohnpaulk. 1. In a saucepan over low heat, place 12 oz. of the cream and the butter until mixture is hot and the butter melts. Do not let mixture boil. 3. Add the white chocolate and let it soften in the hot cream for about 1-minute. Stir the mixture (do not whisk) until it is smooth and all the chocolate melts. 4. Transfer to a bowl and refrigerate until cool to the touch but still pourable about 30-minutes. 5. Then combine the cooled chocolate mixture and beat with the remaining cream, vanilla, and mint extracts until firm peaks are reached. 6. Cover a refrigerate at best overnight. • Break up the candy canes and place them into a coffee grinder. Pulse the grinder until the candy turns into powder. • In a mixer, whip the cream until soft peaks for. 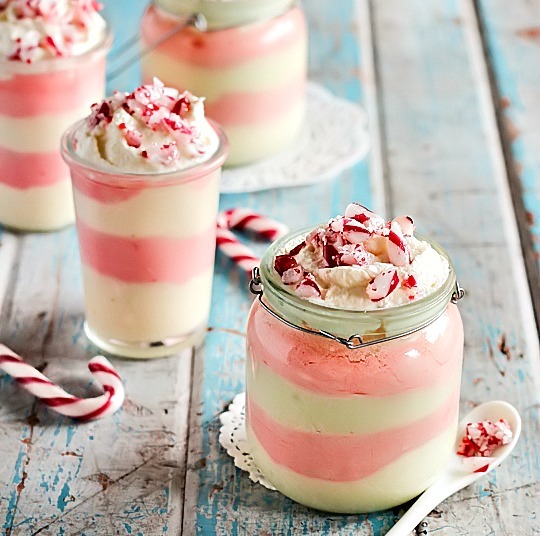 • Fold the peppermint powder into the cream. It will turn a delicate shade of pink. -Post it to Instagram as “White Chocolate Mousse” and tag @chefjohnpaulk. We LOVE to see your pictures and GOOD LUCK with your dish ad Happy Holidays!! 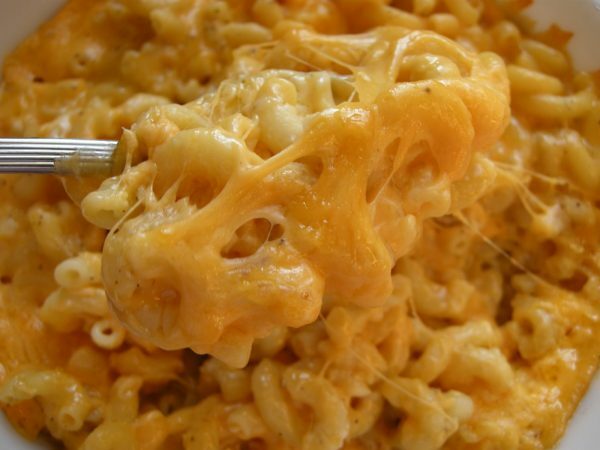 At Mezzaluna, we serve pounds and pounds of our fabulous Mac and Cheese to our catering clients. I can’t believe I’m doing this, because I vowed I’d NEVER share this recipe, but I’m in such a great mood this festive season, so…well…Here you go. See below for instructions on how to end me your pictures! Let me know how you like it. Happy Holidays! 2. Bring a large pot of water to a boil over high heat. Cook pasta, according to package directions, for 2 minutes less than recommended on the package. Rinse pasta in cold water; set aside. 3. In a sauce pan, melt butter then whisk in flour and cook until it is a pale brown roux approx. 2-3 minutes. 4. Slowly whisk in milk until no lumps appear and mixture thickens and just comes to a simmer. 5. Lightly sweat minced onion in a little olive oil over medium-low heat, until softended and translucent. Set aside. 6. Turn heat off of roux and gradually add cheeses, spices and tabasco, and mix until melted. Add onions. -Post it to Instagram as “Chef John’s Crusty Baked Mac and Cheese” and tag @chefjohnpaulk. This recipe is a terrific addition to your holiday brunch table or Christmas Morning celebration. I’ve made this recipe for more than 15 years and my sons and I never get tired of it. Try it…you can also toss some fresh raspberries, or blueberries on the top just before baking. 1. In a small heavy saucepan melt butter with brown sugar and corn syrup over moderate heat, stirring, until smooth and pour into a 13- by 9- by 2-inch baking dish. 2. Cut six 1-inch thick slices from center portion of bread, reserving ends for another use, and trim crusts. Arrange bread slices in one layer in baking dish, squeezing them slightly to fit. 3. In a bowl whisk together eggs, half-and-half, vanilla, Grand Marnier, and salt until combined well and pour evenly over bread. Chill bread mixture, covered, at least 8 hours and up to 1 day. 4. Preheat oven to 350° F. and bring bread to room temperature. 5. Bake bread mixture, uncovered, in middle of oven until puffed and edges are pale golden, 35 to 40 minutes. 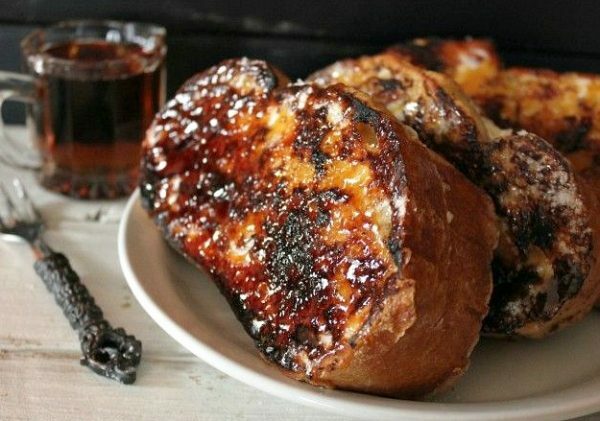 Serve hot French toast immediately. 1. Remove crab legs and cut at joints. Cut crab body into quarters; scrape out gills and intestines and discard. 2. Heat olive oil in large pot over high heat. Add chopped onion, marjoram and bay leaf. Sauté 2 minutes. 3. Add anchovies, parsley, garlic and harissa paste; sauté 2 minutes. Add crab legs and body pieces and white wine. Reduce heat; simmer 4 minutes. 4. Add stock and tomatoes. Increase heat and boil 5 minutes. 5. Add mussels; cook until mussels open, about 7 minutes (discard any mussels that do not open). 6. Add remaining seafood; simmer until cod and shrimp are opaque in center, stirring often, about 4 minutes. 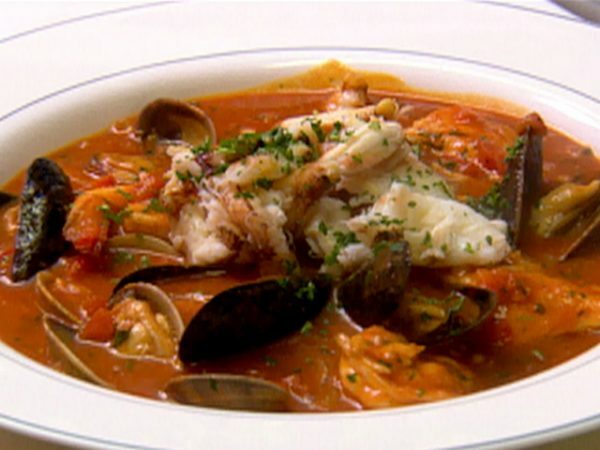 -Post it to Instagram as “Chef John’s DECADENT Spicy Seafood Cioppino” and tag @chefjohnpaulk. 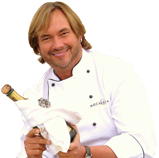 We LOVE to see your pictures and GOOD LUCK with your dish and Happy Holidays!! Heavily coat inside of pans with Vegoline spray. Set aside. In a large skillet, heat 6 tablespoons butter over medium heat until it sizzles. Add cranberries, and cook until shiny, 2 to 3 minutes. Add maple syrup and cinnamon. Cook, stirring frequently, until cranberries soften but still hold their shape, about 5 minutes. Remove cranberries with a slotted spoon, and transfer to a baking sheet to cool slightly. Set skillet with syrup aside. Arrange cranberries in the prepared pan. Return skillet with syrup to medium heat, and cook until syrup boils, 3 to 4 minutes; do not overcook. Immediately pour syrup over cranberries, and let cool, about 10 minutes. Sift together flour, baking powder, and salt. Mix in cornmeal with a fork. Set aside. Place remaining 6 tablespoons butter in an electric mixer fitted with the paddle attachment. Crumble in almond paste and, using the paddle, beat on medium speed until well combined, about 30 seconds. In a clean bowl, use the whisk attachment to beat egg whites until foamy. Slowly add remaining 2 tablespoons sugar; beat until soft peaks form. Whisk a third of the whites into batter, then fold in remaining whites. Spread batter over cranberries, and bake for 45 minutes, or until a toothpick inserted in center comes out clean. Let cool in pan 2 hours before inverting onto a serving plate. 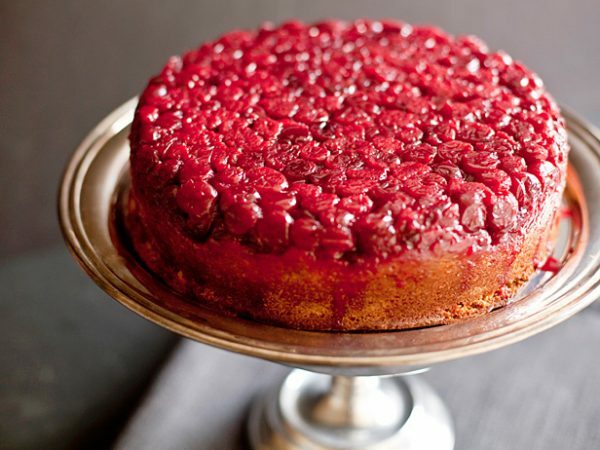 -Post it to Instagram as “Cranberry Upside-Down Cake” and tag @chefjohnpaulk. We LOVE to see your pictures and GOOD LUCK with your cake! View more of our award winning cuisine by visiting our Galleries Page Here! Interested in connecting on catering? Give us a call or fill out our contact form Here. Full Recipe and Instructions Below! Then, Get your camera ready so you can take a picture and show me how yours looks after it’s done! Instructions on how to do that at the end of the recipe! In an 8-inch square or round heavy aluminum cake pan placed over medium heat, melt 2 Tbs. of the butter. Add the granulated sugar and cook, stirring occasionally, until the sugar melts and turns light brown, 5 to 7 minutes. Arrange the pear slices in the pan in 4 overlapping rows. Set aside. Sift together the flour, baking soda, ground ginger, cardamom, cinnamon and salt. Stir in the fresh ginger. Set aside. In the bowl of an electric mixer fitted with the flat beater, beat the remaining 6 Tbs. (3/4 stick) butter until creamy. Add the brown sugar and beat until the mixture is pale and fluffy. Slowly drizzle in the egg, beating each addition until incorporated before continuing. Beat in the molasses. Reduce the speed to medium-low and add the flour mixture in 3 additions, alternating with the milk and beginning and ending with the flour. Beat just until combined. Pour the batter on top of the pears and spread it evenly to the edge of the pan. Bake until the top of the cake is puffed, 35 to 40 minutes. Transfer the pan to a wire rack and let cool for 10 minutes. Place a serving plate upside down on the pan. Wearing oven mitts, invert the plate and pan together. Lift off the pan. 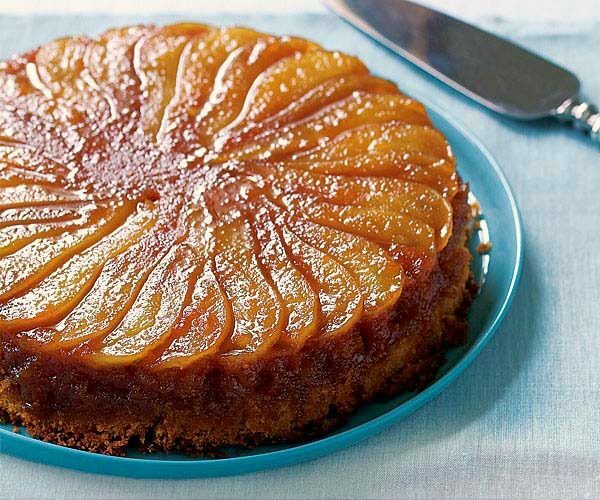 Dislodge any pear slices that stick to the pan and arrange them on top of the cake. Serve at room temperature. -Post it to Instagram as “Caramelized Pear Up-Side Down Gingerbread Cake” and tag @chefjohnpaulk.